Johann “John” Degerstrom was the first of my ancestors to arrive in Maine from Sweden in 1870. Going back 10 years ago, I could only trace the paternal name about 100 years in America, and then through internet contacts I can now name the Swedish paternal line back to the year 1560. John was the oldest child of my great great grandfather. The oldest sister, Katrina, followed in 1880, and then the entire clan in 1881. John and his brother Lars “Fred” Degerstrom, who is my great grandfather, lived in separate homes on Degerstrom Road in Monson, Maine. Both homes are still there although Fred’s is no longer inhabitable. The old photo here shows John with an axe over his shoulder at a rustic log cabin in the backwoods of Maine. 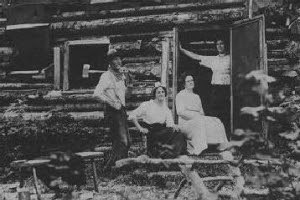 The Swedish family ancestors were mostly farmers or joined the military, and their home near the Arctic Circle of Norrbotten Lans in Northern Sweden meant they stayed close to nature. This trait and an appreciation for the outdoors has been passed down to all generations. John first worked as a lumberjack, and was famous for his skill with a double bladed axe, and few could match his daily production of felled trees which were cut to length in cords of wood. Keep in mind this was long before chain saws. Reflecting on my childhood Growin’ Up in Maine in the 1950’s and 60’s, this photo reminds me of the many log cabins my friends and I built as youngsters.